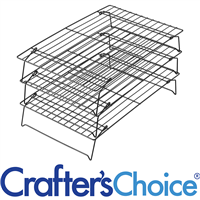 Cutters, Pans and Racks that allow you to stay neat and organized when cutting and resting your homemade soaps and cosmetics. Use the shaped soap cutters for unique designs or our straight soap cutter for clean cuts, then let rest on our stackable racks or pans. The Mitre Box is perfect for holding soap in place while slicing a loaf into individual bars. Specifically designed to work with soap loafs formed with the Crafter's Choice Regular Silicone Loaf Mold. Both the straight and wavy cutters fit into the cutting slot. 1" cuts. No more scraping your knuckles making soap embeds with a manual shredder! 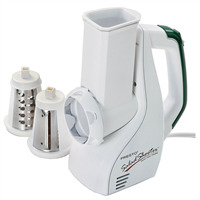 This salad shooter is great for quickly making uniformly grated soap embeds. This tool is a major time saver for busy soap makers! Stackable Racks are a "must have" space saver. Three tiers for saving space while cooling batches of soap. Simply place cooling or curing soap on these racks to save space. Best soap cutter on the market! 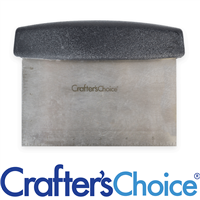 When used with the Crafter's Choice Mitre Box, it cuts straight each time. Ruler along the bottom that is ideal for free hand cutting. 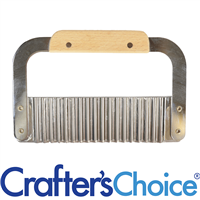 Our Wavy Soap Cutter can be used to achieve a perfect wavy edge on each soap bar! 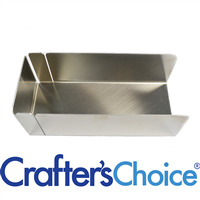 When used with the Crafter's Choice Mitre Box, it cuts straight down each time. This tool is a great way to add flare to handmade bars of soap.